In case you thought you’d suddenly forgotten how to read, yes, this new bar is called the Gobpsy, no matter how much autocorrect might disagree with you. 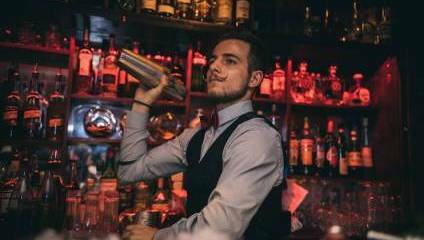 Hidden away under a working barbershop (beware of flying razors), you’ll have to play along in order to access the bar – which is a lot of the fun of it, of course. Having entered the shop, you’ll first be welcomed by a Gatsby-esque host, who will at first deny the existence of any such bar. But if you manage to quell her suspicions, you’ll be able to push past the inconspicuous towel shelf at the back of the shop to descend the stairs to the bar. Ah, but not so fast – first you’ll have to convince the big boss that you’re cool to come in, too. Then, finally, you can enjoy a well-earned cocktail in the intimate, low-lit bar, decorated with just a splash of 1920s ambience. The drinks choices are as eclectic and creative as the bar itself, with flavours ranging from chocolate orange to smoked paprika and tamarillo. Don’t miss the happy hour either – and as it’s every day between 5 and 7, it’s hard to.